« 3 Common Mistakes Busy Moms Make That Keep Them Sick, Tired, & Stressed Out..and What They Can Do About It! Want an easy way to add more veggies and fruit to your diet, while being yummy and filling? 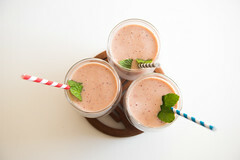 Join HMN San Jose while we taste test a variety of smoothie recipes – both non-dairy and dairy options available. This will be a fun tasting where we’ll discuss the benefits of smoothies and taste test to see what recipes work for us.